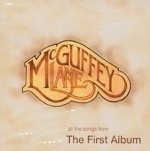 McGuffey Lane is an American country rock band from Columbus, Ohio. McGuffey Lane was formed in 1972 by Terry Efaw and Steve Reis, who played together under the name Scotch & Soda. After adding vocalist and guitarist Bobby Gene McNelly, they renamed themselves McGuffey Lane, the location of Reis’s Athens, Ohio home. They eventually expanded to a sextet and became well-known locally, releasing their first album on their own Paradise Island record label. The LP sold over 40,000 copies, and eventually resulted in their signing with Atco Records. They reissued the debut in 1980 and toured with the Charlie Daniels Band, The Judds and the Allman Brothers Band. The follow-up, Aqua Dream, featured the single “Start It All Over”, which became a crossover pop hit, reaching No. 97 on the Billboard Hot 100. The group scored several minor hits on the country charts, but their label wanted to market them more as a pop-country act in the vein of Alabama. They moved to Atlantic Records in hopes of focusing on success on the country charts, but as they prepared 1984’s Day By Day, keyboardist Tebes Douglass was killed in a car crash. Soon after, Bobby Gene McNelly left the group to pursue a solo career, and around 1985 the group was dropped from Atlantic. In 1986, they released a Christmas album in support of the Central Ohio Lung Association; towards the end of the year they inked a sponsorship with Miller Beer, but a planned comeback fizzled. The group played into the late 1980s but had dissolved by 1990. In 1995 they reunited after releasing a greatest hits album, and continued performing locally in Ohio into the 2000s. Two full-length releases followed the reunion, in 1998 and 2002. Today, McGuffey Lane still performs 30-35 concerts annually. In March 2010, Lick Records signed a distribution deal with E1 Entertainment, which will allow the new McGuffey Lane album to be sold in Wal-Mart and Best Buy. On August 18, 2009 they opened for Lynyrd Skynyrd at The LC in Columbus, Ohio. Take listen and let me know what you think. Have a fantastic Monday. Enjoy the simple things around you. See you on Wednesday for a post. Categories: Finding Joy, Just Because, MUSIC, Music Monday, Ohio | Tags: American country rock band, Columbus, Happiness, Joy, McGuffey Lane, motivation, Music, music monday, my life, Ohio, simple things, Terry Efaw | Permalink. Great band to listen to when you are relaxing or just hanging out. Great harmonies and simple melodies. Can’t ask for anything else. I remember a couple of summers that we used to go almost every Friday after work or Satuday afternoon to see them. They were always playing outside and it was usually a free concert or at least cheap!! Phil Dirt and the Dozers or the Michael Stanley Band or another one that I cannot remember the name of. Sigh….the good old days. These guys do remind me of the good ole days. Long summer nights listening to music. That is so cool that you have had the chance to listen to them when they first started out. Very cool.